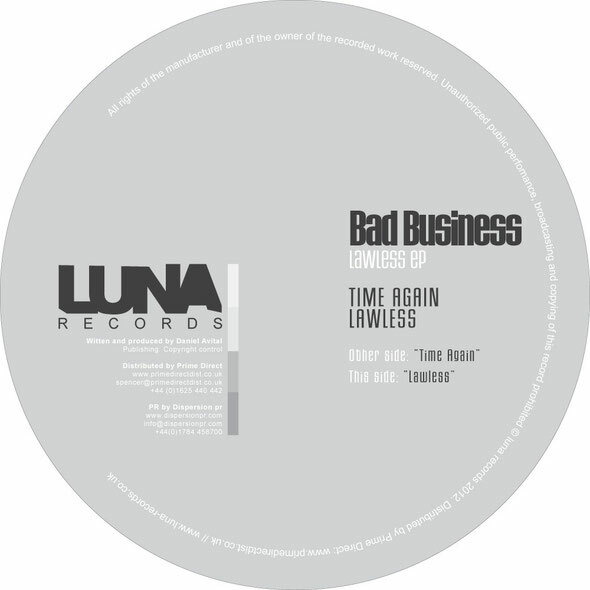 The Luna Records label returns with a new single from Israeli producer Bad Business featuring two electronic vocal tracks. Middlesbrough based Luna Records has had a run of things since launching in late 2009. Singles from the likes of DZeta N’ Basile, Ben Rau, DJ W!ld and label boss Paul Bowen have helped build the label’s reputation for electronic music whilst the imprint’s eclectic musical approach has ensured that each new release is treated as something of an event. Staying true to this eclectic ethos, Luna Records now team up with Bad Business for a single that encompasses elements of house, techno and electronica. Daniel Avital AKA Bad Business is a Tel Aviv based producer who has previously found success as one half of PigCity, releasing records through labels such as Alma Soul & Zoo:Technique. Early 2012 saw him go solo with a debut release on Escapism Musique backed with mixes from Mario Basanov, Yokko & Dirty Culture now he returns with a new release entitled the ‘Lawless EP’. The release kicks off with ‘Time Again’ a deep and dark tinged electronic workout that fuses edgy melodic elements with Avital haunting, ethereal vocals, quality stuff. On the flip is title track ‘Lawless’ that sees Bad Business journey into hypnotic house territory with a tech fuelled cut that features heavily effected vocals, swirling FX and skittering drum programming. Out 7th January.